Quality Swiss made, environmentally friendly pens at a value price point. Essential and iconic, this pen has a simple and sophisticated shape. Designed by the BMW Group subsidiary "Designworks USA" and nominated for the German Design Award 2015. 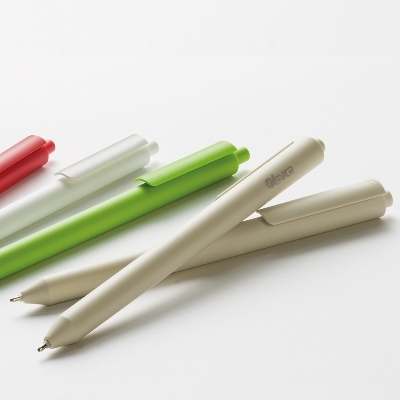 Produced from PLA, a plastic material of vegetable origin that is obtained from non edible resources, this pen is biodegradable through proper composting. Exceptionally strong 1 peice molded barrel, so the pen wont crack or break under pressure. Long Ballpoint writing distance of 2500m, giving you more impressions for yor brand. Colours: Your choice of Beige, Green, White, Red, Yellow (all with matt finish) for Barrel, Clip and Button. Ink: Blue or Black. Leadtime: Express Indent from Switzerland. Approx. 3-4 weeks from artwork approval to local despatch. Price includes: Up to 2 colour print, 1 position. Price includes Setup.